Minneapolis, Minn. — Confidence is a funny thing. When it’s gone like in Minnesota’s record against the in-state schools the past four seasons, you wonder when you’ll ever see it again. 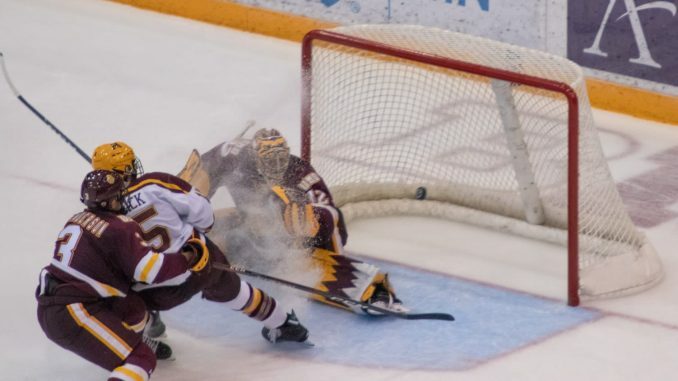 The Bulldogs held a nine game unbeaten streak over the Gophers that stretched back to November 14, 2014, but that streak ended Sunday and Minnesota started a new streak by scoring seven goals. 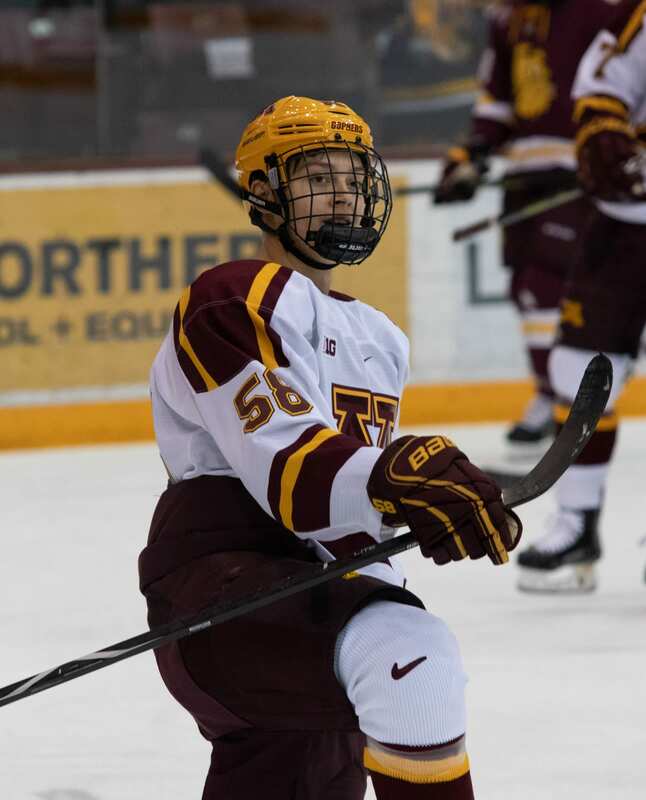 Minnesota got goals from six different players and points from 11 different players in a 7-4 win in front of 8,115 fans at 3M Arena at Mariucci. Brannon McManus tallied the first two goal of the game, Sampo Ranta got his second of the season, Tyler Sheehy got his first, Rem Pitlick got his first, and Sammy Walker and Garrett Wait each got their first collegiate goals. Motzko commented how the players reactions from scoring their first ones of the season allow them to go out and play–the guys can come back to practice on Monday with fuel in their game and the confidence to score more. McManus got an early hat trick last season, but a shoulder injury put a damper on much of his performance afterwards. He has surgery over the summer and the rehab paid off on his first goal of the season. Mat Robson also played with confidence and was tabbed to play back-to-back games to start the season. Motzko said the decision wasn’t made until after his 31 save performance on Saturday, and Robson answered the challenge by keeping his team in the game despite taking four penalties during the second period. The junior goalie made 42 saves on the night as the Bulldogs attempted 72 shots. The win was the first for Jack Ramsey and the seniors over Minnesota Duluth and started off the Motzko-era of Gopher Hockey at Mariucci. The Gophers get two bye weeks back to back after this weekend to figure it out going forward. They’ll play exhibitions in Ann Arbor against the USNTDP and then welcome Trinity Western on October 20 before their next game against North Dakota in Las Vegas on October 27. Motzko was quick to say he’s not disappointed to have the time to work with his new team and that they need practice right now. He admits they have a lot of young and inexperienced players in the lineup and that they need the time to get ready to play the Fighting Hawks.